It is with deep pain and anguish that I am writing this post. A dear friend Selma of Selma’s table passed away on the 4th of July. She was an inspiring food blogger,cook,photographer,food stylist, a wonderful mother and most of all an exceptional human being. Kind,caring,cheerful and effervescent Selma was a woman who touched many lives. She was an amazing co-blogger who with her helpful ways soon grew to be a dear friend. I am sure so many of you who knew her agree with me. With her gentle demeanor and encouraging words she built a strong rapport with every one around her. I can never forget that it was Selma who gave me technical help when I was unable to use recipe codes for publishing the print version of recipes on my blog. 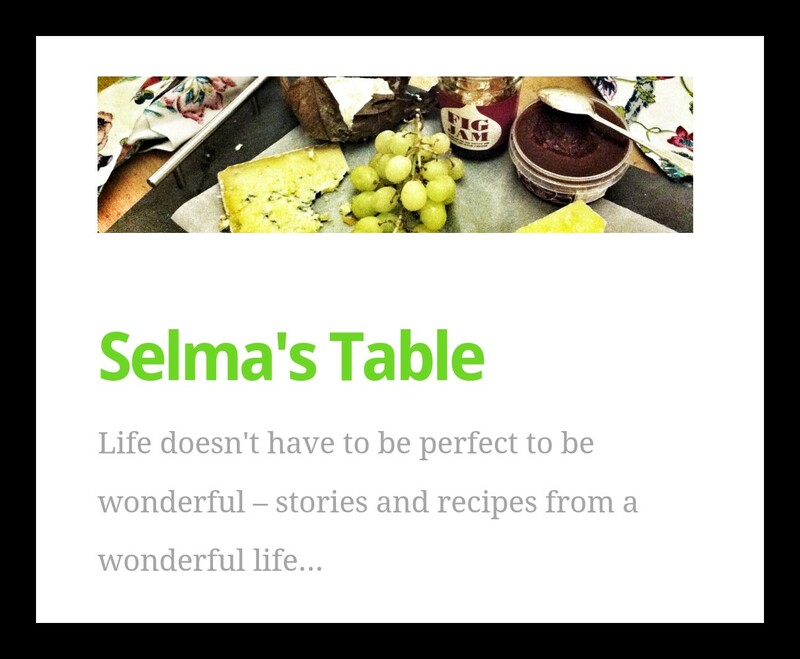 With lots of admiration and regards, I have to say that every single time I post my recipe, for the rest of my blogging life,Selma will be in front of my eyes and in my thoughts.The only thing I can do is pray that Almighty bless her soul. Selma’s untimely demise is a huge loss to the blogging community as a whole.She did not let her pain show through her smile, never letting us know what she was going through. Even in her final post , she was so excited because her son, Jake was visiting her on his study break. She was like all mothers so happy to spend time with him, shopping with him and cooking for him. Selma mentioned that the young man adored the ‘Po boy toastie’ that she lovingly made for him and asked her if she could make it again for him. I don’t know if she could. My heart melted when I reread that post after she expired. May her family get the strength to overcome this loss. I don’t think I need to say anything more about her.I think her tagline says it all. If you want to know more about the dazzling lady,please do read the about page on her blog and take a virtual tour of her treasure trove, her timeless recipes made with so much love and care. 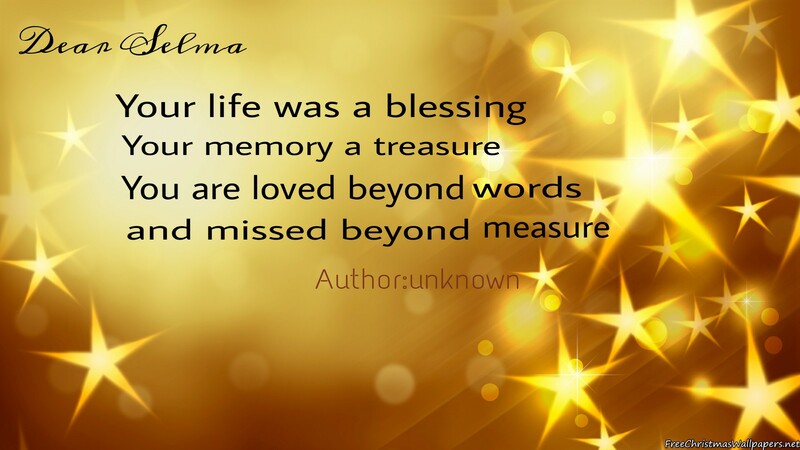 Dear Selma, you will be truly missed………………. You said so many things that the rest of us feel. Thank you skd! It is rather unfortunate that I had to put up this post Julie. A beautiful and loving tribute to Selma. It’s a terrible loss. You are right Suzanne. It was shocking to hear. You’ve covered it all here, all of her attributes. Thank you for the moving prayer too. Your post is full of love and warmth. We are honored to have you join us in the tribute. Selma was a gentle soul and meant a lot to all of us Sue. Its the least we can do to honor her. Thank you so much for organising the tribute. Although, I did not know Selma only through her recipes on Tasty Kitchen.com of which I am a member with over 1,097 recipes posted her legacy of recipes will live on because some of her recipes I viewed were wonderful on TK. I posted a tribute on there for this friend to the entire blogging world here in US and abroad. For ech life she touched through her recipes. May you rest in peace. To all her family and friends i hope you will find solace in time. It is really remarkable Cheryl how there are so many of us who were touched by her life. I have never been to TK. But now I will. Thank you for letting me know. You were closest to Selma dear Elaine. I can understand your grief and how you have been a big support to the rest of her friends and community. I have written this with a heavy heart Angie. I wish we didn’t have to do this and our dear friend was amongst us. Thank you for taking up the initiative and organising this tribute. It is more comforting than feeling sad alone. I have forgotten to add link ups to the FF tribute page so that more people can join in honoring Selma. I will do it soon. Such beautiful words for your dear friend. My heart goes out to you and the rest of her family, may she rest in peace. Thank you for the prayer Dana. Never thought that a blogger friend can become so endearing. Your post says it all, Ana, in words about Selma, her warm character and always finding time for everyone. She was a very kind and thoughtful lady who deserves such a tribute. I chose to remember her in a recipe using a part of her sourdough starter Twinkle. Selma was a darn good cook and baker! I loved the feel of your tribute. You honored Selma in a positive way. Your Twinkle and Rosebud will remind you of her in a beautiful way as long as they last. Actually it can last forever as long as I take care of it. I usually bought my starters from KAF which was descended from a starter back to the 1700’s. That’s how old the company is… I am keeping Rosebud in my upstairs refrigerator so I will be reminded to nourish her or make something with her. My previous starters were in the basement fridge before and got neglected! They also say by naming your starter you stand a better chance of keeping it alive. A starter from 1700. Isn’t that amazing!! Hope and wish to see many more recipes from Twinkle and Rosebud. Selma was a beautiful person and loved by everyone who knew her . Thank you Shehanne. A lovely post, and some lovely memories you share. I didn’t know her as well as many others, but I sense you describe her so well and as you say, her tagline says it all. A lovely tribute. This is a wonderful tribute to Selma–thanks for sharing your memories of her. Thank you Arl. Selma will be truly missed in our circles. Just a wonderful tribute to Selma, Ana. So many of us are grieving, and I’ll say this is a beautiful way to all come together and honor her. Your poem is lovely and will have touched her deeply. 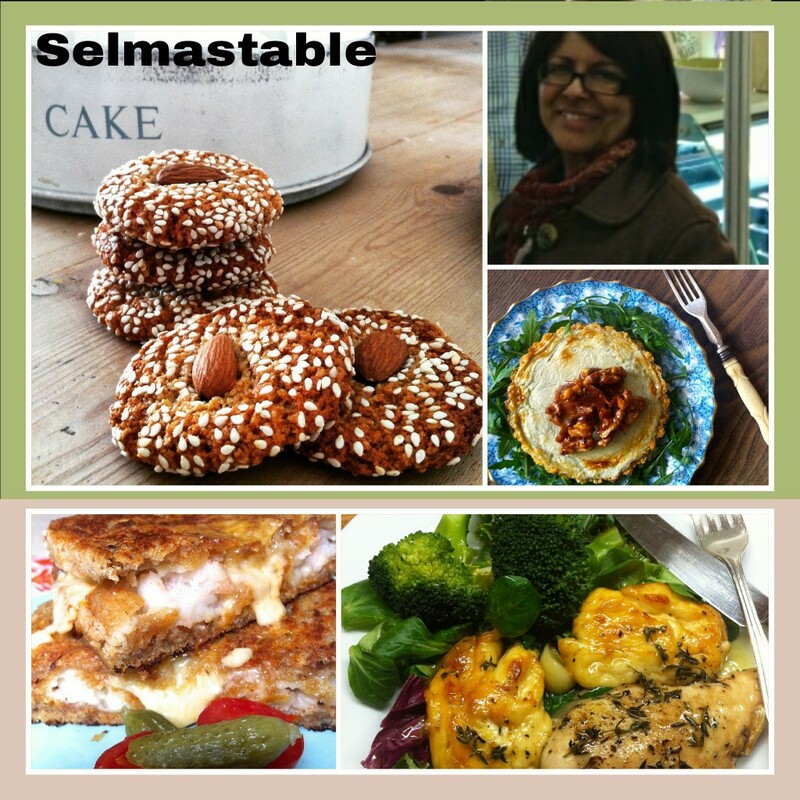 Selma taught me to embed the recipe and use the print feature too. I always have it sitting by my computer with several of her other notes when I first started out as a new blogger. She reached out to so many of us. May her spirit and enthusiasm live on in our hearts forever. Thanks for sharing your thoughts with us. Yes. I remember you mentioned that Selma helped you with the embedding. I also have to thank you for the useful tips you gave me then Loretta. We lost a dear friend in Selma. Isn’t it really amazing that we can feel so sad for a friend we never met. Thank you for the nice prayer. She was a darling of the blogger community and a brave lady. This is a lovely tribute to Selma! Selma was indeed a gem of a person. Her recipes and starters which she shared still make her benevolent presence felt. Thank you so much for stopping by and please do restart your blogging. I would love to visit your blog.